We've said it before, and we'll say it again: This girl is on fire. We're not even halfway into 2014, and already Lupita Nyong'o has bagged an Oscar, landed atop every best-dressed list there is, and scored a major beauty contract. Oh, and today, she was named People's Most Beautiful. NBD. We don't always buy into these lofty titles, but this year it seems that People's choice is right on the money. There's just no competing with that grace, those expressive eyes, that flawless skin. And, hello, don't get us started on the braid hat. Apparently, the braid hat is just the latest evidence of the actress' experimental streak. 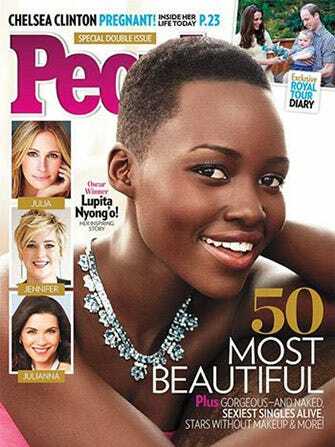 Nyong'o tells the magazine that she's shaved her head and dyed her hair every color (except blonde), which doesn't really surprise us given her love of intensely pigmented gowns. Still, she says she feels prettiest when she keeps things simple. "[The best is] when I have been called beautiful with not one drop of makeup on," she says. "And, also before I comb my hair or put on a pretty dress. Happiness is the most important thing."